Attaches to window on one point. 16-1/2" spread with in the closed positon. 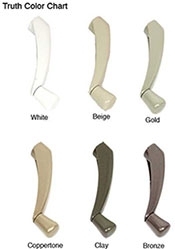 The Wi11454 handle in matching color is included with the operator, along with the Wi20008 Sash Hook.